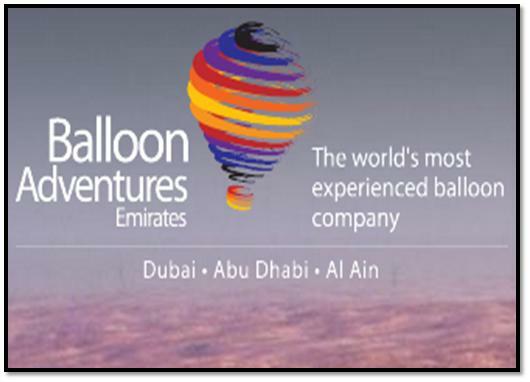 Balloon Adventures Emirates LLC in Dubai is a renowned name in providing bird’s eye view of Dubai’s beautiful desert scenery including camels and gazelles. Apart from providing their services in Dubai, Abu Dhabi and Al Ain, they are also operating in New Zealand, Hungary and Germany. This company is believed to be the most experienced balloon company in the world. Their skilled and highly experienced staff on the ground and in the air guarantees you an unparalleled ballooning experience. Certified by the General Civil Aviation Authority (Air Operator’s Certificate AT024), this balloon company ensures the high level safety and entertainment to make a memorable day out for you and your whole family. Moreover, they have two of the biggest and high-tech hot air balloons in the world, which can accommodate around 40 passengers at a time. In order to ensure proper security and safety for the passengers, all balloons are regularly tested according to the international standards. Balloon Adventures Emirates remains open for seven days a week. From Sunday to Thursday, its operational hours are between 9 am to 10 pm, whereas on Friday and Saturday, the timings are 9 am to 9 pm. Balloon Adventures Emirates provides free transportation to the customers. If you are a tourist and staying in a hotel in the urban area of Dubai, or you are resident of Dubai, the company will provide pick & drop service from central meeting points. Their meeting points are Dubai Festival City and in front of Plug-ins store.